For the second weekend running, travel plans had to be adjusted due to the closure of Euston, although the switch to the Met line wasn’t too much of a hardship. When I boarded at Finchley Road, I was happy to spot Swansea Steve, so was treated to delightful company all the way to the West Herts. Like many others, I arrived before the doors opened, so joined Don in his car to shelter from the rain which was chucking it down by this point. When we got in the warm, the jerk chicken and rice certainly hit the spot. 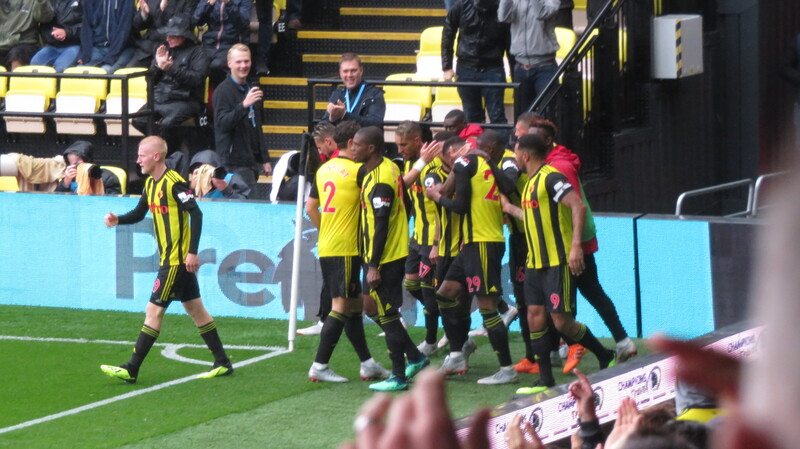 Unsurprisingly, the team news was that Gracia was sticking with the team who started both previous games: Foster; Holebas, Kabasele, Cathcart, Janmaat; Pereyra, Capoue, Doucoure, Hughes; Deeney, Gray. 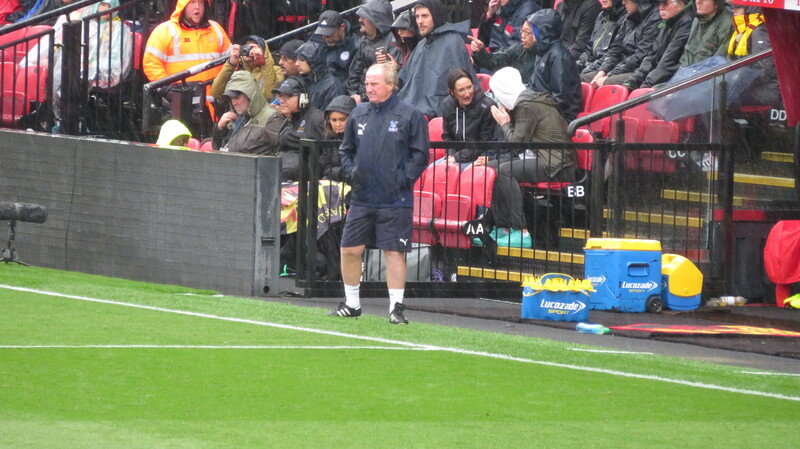 The Palace line-up included unlovely former loanee, Townsend, and the very lovely Ray Lewington was in their dugout. When the teams were announced, Ray was welcomed back by Emma and given a warm ovation by the crowd. The game started well for the visitors, although the first action of note was a booking for Capoue for a foul on Zaha. It has to be said that this looked like a soft challenge from the stands, so was greeted with “Same old Zaha, always cheating,” and “One Harry Hornet.” The television pictures showed it to be a nastier tackle than had been apparent at the time and one atypical for Capoue. The first chance fell to the Hornets as a Janmaat cross was met by a looping header from Deeney that was easily caught by Hennessy. The next into the referee’s book was Zaha for a foul on the saintly Holebas. Palace should have taken the lead in the 12th minute when a cross from Townsend was met by a fantastic header by Benteke, which looked to be flying in until Foster pulled off a magnificent one handed save to keep the game goalless. 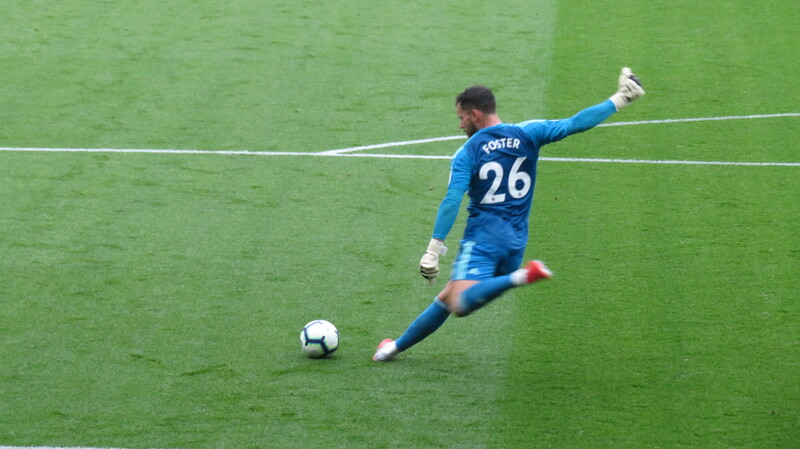 Foster saved the Hornets again soon after as McArthur broke into the box and was one-on-one with the keeper who spread himself and blocked the shot, another excellent save. Watford then had a half chance as Hughes tried a shot that flew wide of the far post. There was a much better attempt soon after as Janmaat’s cross was volleyed goalwards by Pereyra, the shot deflected over the target. Another Janmaat cross ran through a couple of dummies to Pereyra, this time Hennessey pulled off a low save. 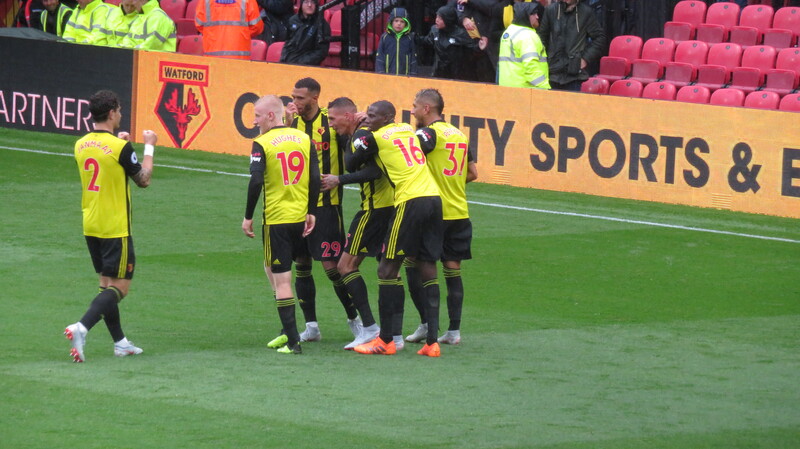 McArthur broke into the Watford box again, this time he was stopped from shooting by a great tackle from Holebas and Foster was able to gather the ball. Some niggle between Zaha and Janmaat while waiting for a throw-in lead to the Watford man being booked while his equally culpable counterpart was allowed to walk, presumably as the referee did not want to show a red card. Watford were having more of an impact late in the half as a shot from the edge of the area by Doucouré was blocked. Then Gray played in Janmaat whose shot was just wide of the far post. At the other end Benteke was released and looked sure to break the deadlock when Kabasele made a wonderful saving tackle to avert the danger. So we reached half time goalless after an even 45 minutes of football. During the break, they announced that there would be a reunion of the boys of 1999 at Shendish in December. Micah Hyde was on hand to talk about those days and to see him walking around the pitch with Richard Johnson afterwards made my heart sing. 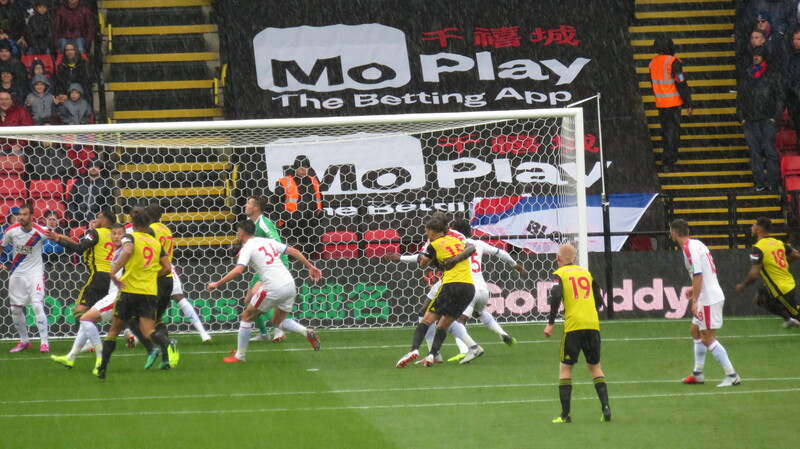 Watford started the second half on the front foot as the Palace defence failed to clear a cross from Janmaat and the ball fell to Hughes whose shot was blocked. Doucouré then did well to win the ball and play a one-two with Deeney, but his final shot was disappointingly wayward. Doucouré then turned provider laying the ball back to Pereyra whose shot was over the bar. Watford took the lead in the 53rd minute with a superb goal as Capoue picked the ball up in the Watford half, ran half the length of the field beating a couple of men on the way before finding Pereyra who curled the ball past Hennessey into the bottom corner. It all went a bit quiet for a while until Benteke tried a curler but his was wide of the far post. 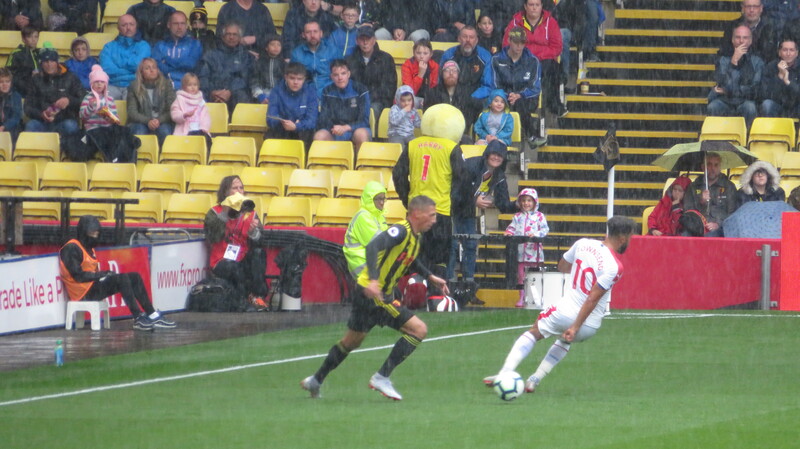 Then a ball was played out to Holebas who crossed the ball over Hennessey and into the top corner. It came out of nowhere. I’m sure that made him smile, it certainly did us as we were roaring with laughter. Each side then made a substitution with Watford bringing Sema on for Gray and the visitors replacing Schlupp with Meyer. Palace pulled a goal back with 12 minutes to go as Zaha snuck along the byline and shot from a tight angle through Foster’s legs to give the Hornets a very nervous end to the game. Watford could have sealed the points as a Holebas corner was met by the head of Kabasele, but the header was wide of the target. Palace made a further change bringing Sørloth on for Benteke. Pereyra then picked up a silly booking for pulling Ward back. Watford’s final substitution saw Success come on for Deeney who handed the captain’s armband to Sema. The substitute had a chance to finish the game off in the last minute of time added on, but his shot was weak and easily saved by Hennessey. Unfortunately this allowed Palace a great chance to level the game as a corner from Milivojevic reached Ward who looked sure to head it past Foster, but instead it flew the wrong side of the post (for them) and Watford secured the three points and kept their 100% record. It was no classic, but it had been a decent battling performance by the Hornets who deserved the win. This is really looking like a great team and it was pleasing to see Kabasele given the man of the match award after a very solid performance at the back. Foster deserves plaudits for the two early saves that kept Watford in the game. But it was a team performance and the celebrations at the final whistle were mighty, indicating a very happy and cohesive group of players. But what about the main man? Harry was on his best behaviour. Chants of “he’s gonna dive in a minute” from the 1881 were met with a shake of the head and a slapped wrist gesture. That is, until the final whistle had gone and the players had left the pitch when he went full Klinsmann along the ground to cheers from the crowd. For a brief moment after the game, Watford were second in the table to Liverpool which was a flashback to our most successful season. I don’t think we will finish anywhere near as high as that, and we have a couple of difficult games coming up against Spurs and Man Utd, but those are free hits. All we want from this team is to carry on putting in solid performances and winning points off the teams that will be around us at the end of the season. So far so good on that front and long may that continue. This entry was posted in Watford FC and tagged Abdoulaye Doucoure, Alexander Sorloth, Andre Gray, Andros Townsend, Ben Foster, Christian Benteke, Christian Kabasele, Craig Cathcart, Crystal Palace FC, Daryl Janmaat, Etienne Capoue, Isaac Success, James McArthur, Javi Gracia, Jeffrey Schlupp, Joel Ward, Jose Holebas, Ken Sema, Luka Milivojevic, Mamadou Sakho, Martin Kelly, Max Meyer, Patrick van Aanholt, Ray Lewington, Roberto Pereyra, Roy Hodgson, Troy Deeney, Watford FC, Wayne Hennessey, Wilfried Zaha, Will Hughes on August 27, 2018 by franelynn.